Item for sale: Frontier Netgear ADSL2 Modem Router B90-755044-15 Rev 3 Wifi Wireless Check my other listings. Shipping: Usually first class mail (2-3 Day time frame) - I will gladly combine shipping. Payment: This is a PayPal auction. I place a high value on all customers. I pride myself on fast shipping, quality merchandise, and customer service. Positive Feedback is appreciated. Ships with delivery confirmation. That number will be uploaded so the item’s whereabouts are never a mystery. Just selling my old ADSL2 modem. Completely functional and comes with power cord, as well as an Ethernet cable if requested. Selling really cheap since it's just been laying around. Really cheap, you may just need to pay postage if you want it delivered. Included will be the Netopia Modem and an AC Adapter. Device has scuffs and scratches from usage and age. WHAT YOU SEE IN THE PICTURES IS WHAT YOU GET! SOLD AS-IS! 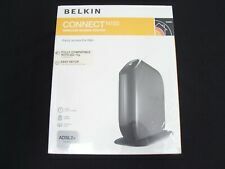 Netgear ADSL2+ Modem Router Model B90-755044-15 Frontier. No Power Cord. No Power Cord. Listed by SM. We will try to be both accurate and as fast as we can be. 4 out of 5 stars - Netgear ADSL2+ Modem Router Model B90-755044-15 Frontier. No Power Cord. 9 product ratings9 product ratings - Netgear ADSL2+ Modem Router Model B90-755044-15 Frontier. No Power Cord. 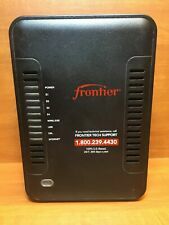 Frontier Netgear modem router. Please see pics for details. Tested to power on only. The unit has not been tested. Only what is shown in the photos is included. Sold as is.